Reigning Miss Universe 2018 Catriona Gray is supporting the native Filipina women's participation in the pageantry. 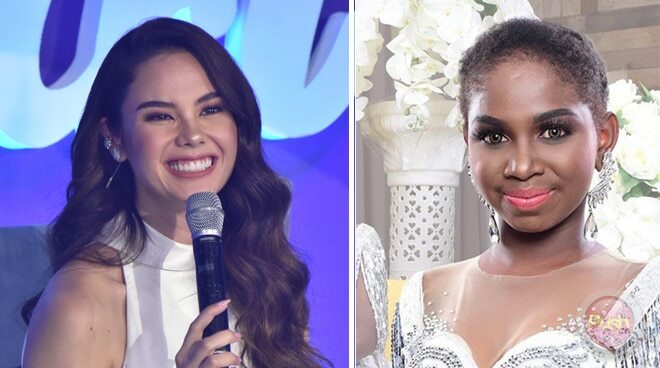 At the press interview last Saturday, April 13, Catriona shared she finds it amazing that Filipinos are praising Aeta beauty queen, Judith Manap. "I think it's amazing. I mean why wouldn't be received positively? Showing diversity in what Filipina is, is what we should be aiming for," Catriona said during her latest endorsement launch for Jollibee. Catriona also said that it would be good for the worldwide pageant community to witness a different kind of Filipina beauty. "Also for the worldwide community I think it would be amazing for them to see the diverse Filipina beauty," she added. Last March 30, Judith's life story was featured on ABS-CBN's drama anthology program, Maalaala Mo Kaya. Judith was portrayed by teen actress Maymay Entrata. Meanwhile, the 25-year-old beauty queen also gave updates on her Mikimoto crown, which was broken during her homecoming parade in the Philippines. "It's being fixed, its in the hands of the masters and it will be back first," she said. READ: How much is Catriona Gray’s Miss Universe Mikimoto crown? Catriona is the newest addition to the pool of endorsers of the fast-food company, Jollibee as she showcased her famous "slow-mo twirl" with the mascot, Twirlie.